More employment cases will be litigated following a landmark Employment Court ruling that paves the way for tens of thousands of home care relief workers to receive the minimum wage and holidays, New Zealand unions predicted. Service and Food Workers Union took the winning case to court and national secretary, John Ryall said litigation to secure workers’ rights was now preferable to collective bargaining. "We decided there’s got to be a better way than (collective bargaining), said Ryall which he described as hopeless. "Every time we win one of these cases, someone stands up, and we discover a new detail of discrimination. I think these cases will continue, until such time as there is a collective bargaining system in place." CTU’s Helen Kelly agreed with the tactic of strategic litigation. "We have to rely on the minimum code – Minimum Wage, Holidays Act, Equal Pay Act – to get any sort of justice. This [latest ruling] is one of a series of cases, and we’ve got more planned," she said. New employment laws that went into effect March 6 will leave workers worse off, warned union leaders. They said provisions of the controversial Employment Relations Amendment Act, which affects collective bargaining, will increase the opportunity for exploitation of workers. 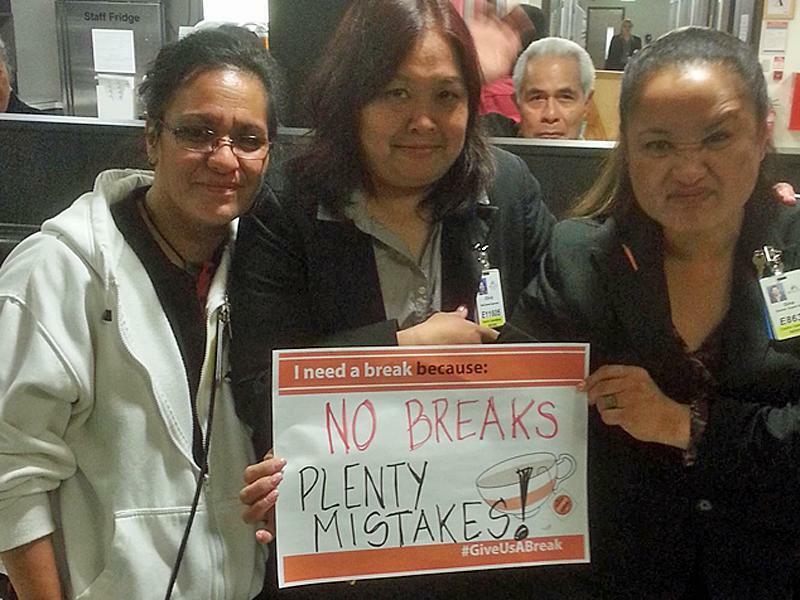 Among other changes, strict rules over breaks are eliminated and employers and workers can agree on the timing or duration of breaks and receive compensation for not taking a break. "This Government should be ashamed of itself. They do not care about New Zealand workers and they are determined to drive wages down in this country and removing their tea break and their lunch break is an absolute attack on every working person in this country," said CTU’s Helen Kelly. The legislation also removes the requirement for new staff to be employed under the collective agreement for the first 30 days and allows employers to walk away from collective bargaining. Others unions such as the NZ Nurses Organisation expressed similar concerns. New Zealand’s unions marked International Woman’s Day on March 8 with a call for the Government and all employers "to commit to ensuring all women, regardless of industry, are fairly paid, have decent and safe workplaces." CTU Women’s Committee Co-convenor, Sheryl Cadman said all women workers, "those in paid and unpaid work," are honoured on International Woman’s Day. She urged the Government to implement a plan to guarantee fair pay and decent work for women. "This needs to include extended paid parental leave, easy access to early childhood education for working parents, family-friendly policies at work and workplaces that are free from bullying and sexual harassment. This plan would lift hundreds of thousands of women and families out of poverty wages and incomes, meet the standard of decent work and provide for a sustainable future," said Cadman. She said the time has come for the Government to start "recognising, accounting and paying for the real value of women’s work." Labour Leader Andrew Little called for a review of excessive rises in the salaries of public service chief executives. Little said public service salaries should be seriously scrutinized following Prime Minister John Key’s move to initiate a change of policy around MP’s pay increases. "Some of these CEOs have had stratospheric pay increases in recent years," Little said. "Such massive discrepancies are contributing to the growing level of inequality in New Zealand. There is no reason why some managers in the public sector are earning more than $600,000 a year." According to news reports, most public service CEO’s are paid more than $600,000, led by Adrian Orr, head of the Superannuation Fund, who makes around $800,000. New Zealand doctors called for a health impact assessment under the Trans Pacific Partnership Agreement (TPPA). Doctors for Healthy Trade representative Dr Erik Monasterio cited a recent Australian report which found significant negative health impacts of the TPPA. He said New Zealand should conduct a similar health assessment. "The assessment needs to be released publicly, so that parliament and the public can discuss the issues – before political trade-offs are made and the agreement is signed," he said. Monasterio charged the negotiations are aimed at protecting "the massive investments profits of multinational companies that can be bigger than the whole New Zealand economy," not about the trade of goods and services. He said governments should publicly release the full draft TPPA text in order to secure independent and comprehensive review of health impacts for each nation. Labour spokesperson for Education and Early Childhood Education Sue Moroney pledged National will be held to its promise to extend parental leave. The Government announced last year that it would increase paid parental leave, phasing it in up to 18 weeks from next year and extend eligibility. But legislation has still not passed to enact the policy. Her private members bill, The Parental Leave and Employment Amendment Bill, recently failed to pass its third and final reading with both the National and ACT Parties opposing the proposal. One provision in the bill was 26 weeks leave for parents in special circumstances. After the defeat of Moroney’s bill, Workplace Relations Minister Michael Woodhouse announced the government will consider extending paid parental leave to 26 weeks for the parents of premature babies, multiple birth babies and babies born with disabilities. Further legislation will be introduced in June. In the U.S., the AFL-CIO opened a campaign against Fast Track authority which provides for an up-and-down vote in Congress on trade treaties without amendment. Unions say Fast Track is used to advance unfair trade deals and they note President Obama wants Fast Track authority for approval of the pending Trans-Pacific Partnership (TPP) trade pact. The campaign includes a lobby day in Washington, D.C., involving union members from more than 20 states. In a demonstration of solidarity and unity, leaders representing 60 unions affiliated and unaffiliated with the AFL-CIO recently signed a joint letter to Congress expressing opposition to Fast Track. "Fast Track is an undemocratic, unaccountable and completely unacceptable way to develop economic policies that affect us all. America needs a new version of trade negotiating authority that brings the process from behind closed doors and prioritizes making life better for people, instead of just making life easier for corporations," they wrote. On Wednesday, March 4, Australia’s unions held a national day of action to oppose austerity measures which they said threaten working conditions and wages for millions of Australians. Rallies and marches were held in major Australian cities, with the largest demonstration staged in Melbourne. The unions are targeting a pending review of the Australian workplace system by the pro-market Productivity Commission. Leaked recommendations include cuts to the minimum wage and the weekend and night "penalty rates," which primarily impact hundreds of thousands of low-paid workers. Abbott’s conservative Liberal-National party was elected with a solid majority in September 2013 over the Labour Party, but now leads the country with one of the lowest approval ratings in Australian history (29 per cent). Abbott recently survived a leadership challenge in an internal revolt by dozens of his colleagues. In Myanmar, more than 100 garment factory workers staged a sit-in protest March 4 after police blocked their march to Yangon city hall, where they planned to set up a second protest camp. The incident is the latest in a bitter labour dispute involving thousands of garment workers who are demanding a raise of K30,000-a-month to K60,000 . More than 3,800 workers from five garment and shoe factories in Yangon industrial zones started picketing in January. Police were deployed against them to end the strikes which led to violent clashes and the arrest of two labour union leaders and an activist, who the government alleges were responsible for instigating the strikes. The strike-hit factories are owned by Chinese and South Korean companies who have rejected the workers’ salary demands. A week of public sector strikes swept across Germany March 2 involving hundreds of thousands of workers led by the giant union Ver.di. Workers are striking for 5.5 per cent more in wages, job security and employment guarantees for trainee workers. Other issues involve pensions and pay scales. Some 200 workers at a university clinic the western city of Essen walked off their jobs first and another 200,000 teachers struck during week. Additional strikes involved coast guard workers, street repair crews and state administrative offices. Ver.di chief Frank Bsirske told the news media that the demands for pay were justified because tax receipts are up in German municipalities. "Anyone who expects good work from qualified workers has to pay them properly," he said. The Maritime Union called for a national inquiry into two recent incidents at the ports of Timaru and Lyttelton that left three workers injured. National secretary of the Maritime Union Joe Fleetwood said long, irregular hours, contracting out, casualisation and increasing pressure to work faster have contributed to a crisis in port safety. "You’ve got certain ports that are trying to contract out of their social conscience and responsibility to the employees that work on the waterfront," he charged. Fleetwood said it was not uncommon for port workers to do 16, 18 or even 20-hour shifts. A national inquiry would identify problems and lay down strict rules and enforceable regulations, he said. Fleetwood also claimed many accidents go unreported behind "the cone of silence" within port companies. According to Maritime New Zealand and WorkSafe New Zealand figures, eight deaths and at least 230 non-fatal incidents occurred on ships and onshore between 2011 and 2014. 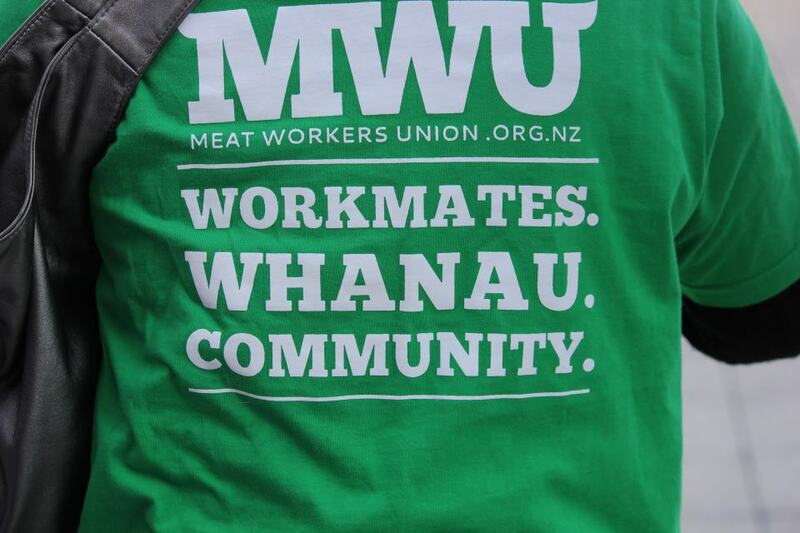 Meat Workers Union’s president Mike Nahu feared the new employment laws could affect negotiations at AFFCO’s eight North Island plants where the union has been trying to negotiate a new agreement for 14 months. Workers fear the company may have stalled talks to avoid a new agreement because, among other changes, employers now can walk away from collective bargaining. "Not saying these things are going to happen but the possibilities of what could arise are actually causing a great deal of concern given the history of the last collective negotiations," he said. Three years ago 1,000 workers were locked out to settle their last collective agreement and workers are worried that they still don’t have a settled collective. "They’re very unsettled at the moment," Nahu said. He reported the company wants to cut more than $100 from workers’ weekly minimum pay and make them work longer days for less. AFFCO, a wholly-owned subsidiary of Talley’s Group, is a leading processor of seafood, vegetables, dairy products and meat.